We’ve added support for the System.Diagnostics Debug/Trace functionality. This allows you to leverage your current investment in this, but leverage the power and flexibility that comes with the ReflectInsight viewer. You can view your Debug/Trace messages in real-time, in a rich viewer that allows you to filter out and search for what really matters to you. 2. Once you have the ReflectInsight Extensions, go to your project in Visual Studio and add a reference to ReflectSoftware.Insight..dll. 4. Now you need to add another configuration file to your project for the Insight configuration details. Typically this file is called Insight.config. We’ve created a NuGet package for our Debug/Trace extension. You can find it over on Nuget. To install the ReflectInsight Debug/Trace extension, run the following command in the Package Manager Console. We’ve added support for the Enterprise Library Logging Application block in our extensions. This allows you to leverage your current investment in Enterprise Library Logging, but leverage the power and flexibility that comes with the ReflectInsight Viewer. You can view your Enterprise Library Logging messages in real-time, in a rich viewer that allows you to filter out and search for what really matters to you. 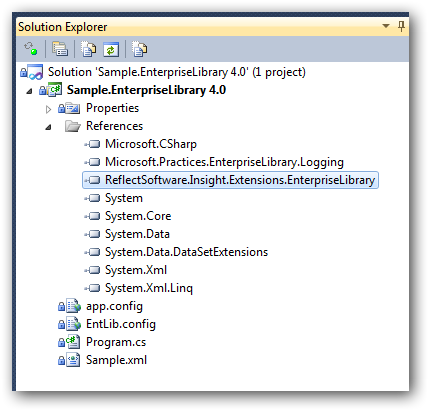 The Enterprise Library extension supports v5.0.505.1 and above. However if you need to support an older version, then you will need to download the ReflectInsight Logging Extensions Library from CodePlex. You can then reference and rebuild the extension against a specific release of the Enterprise Library Logging DLL. The benefits to using the Insight Extensions is that you can easily and quickly add them to your applicable with little effort and then use the ReflectInsight Viewer to view your logging in real-time, allowing you to filter, search, navigate and see the details of your logged messages. One of the nice benefits of using the Enterprise Library extension is that if the message you log is XML content, then the extension will automatically transform your message into the SendXML message type which will show up in the XML syntax. 2. Download the ReflectInsight Extension Binaries or Source and rebuild if necessary. 3. 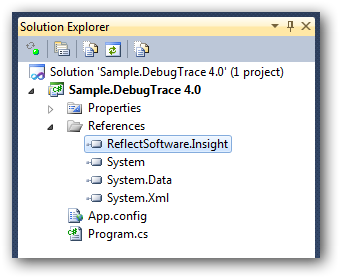 Once you have the ReflectInsight Extensions, go to your project in Visual Studio and add a reference to ReflectSoftware.Insight.Extensions.EnterpriseLibrary.dll. 5. Now you need to add another configuration file to your project for the Insight configuration. Typically this is called Insight.config. 8. That’s it, you’re done! 9. For an even easier setup and configuration, try using our NuGet package which will automate all of this for you. 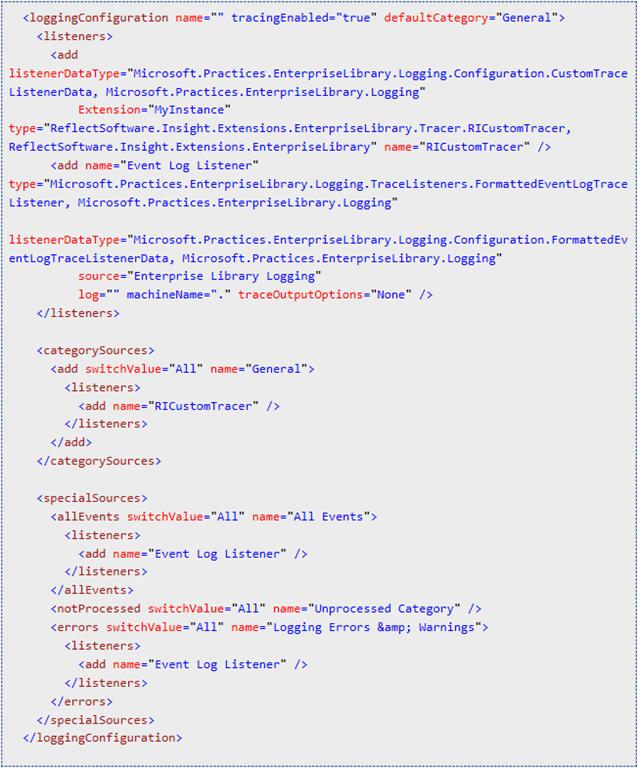 We’ve created a NuGet package for our Enterprise Library extension. You can find it over on Nuget. To install ReflectSoftware.Insight.Extensions.EnterpriseLibrary extension, run the following command in the Package Manager Console.